Selling your home can be a long, complicated process, and to make things even more complex, there are a variety of routes you can go about selling your home. You can go the traditional way, where you’ll hire a real estate agent and pay a good chunk of change in commissions and fees. Then there’s our way, which in fact, isn’t so lengthy or inconvenient. 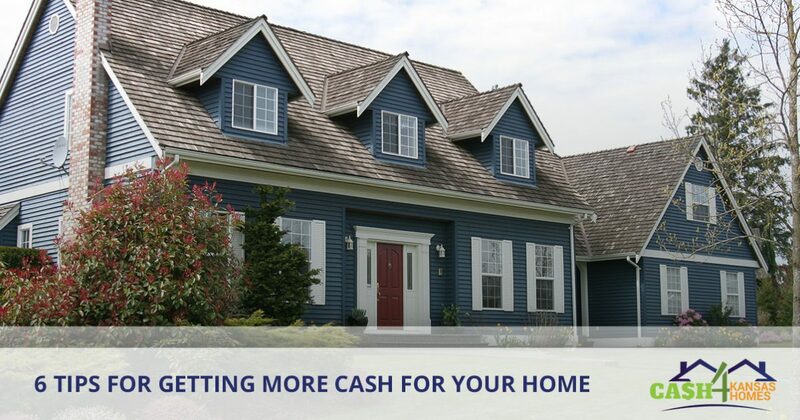 At Cash 4 Kansas Homes, we buy houses and provide our clients with reasonable all-cash offers for their homes. If you’re interested in selling your home for fast and easy cash, reach out to our team today to get an offer on your Kansas City area home. In this blog, we’ll go over six basic ways you can get more cash for your home when you’re in the home-selling process. A bad paint job or a paint job that is desperately peeling can make your home look dumpy and old, ultimately affecting its overall value. By simply investing in a paint touch-up, you can make your home look significantly better and newer! If you don’t have the funds or time to do your entire home, we suggest tackling the most obvious places of your home first — for example, wherever there is significant paint chipping, cracking or peeling. A simple paint touch-up goes a long way for potential homebuyers! Think about the most beautiful homes you know: Are they accompanied by clean, beautiful landscaping? Chances are, your response to that question is “yes.” As much as we are taught not to judge a book by its cover, we often do, and most homebuyers will judge a home based on the way its exterior looks. If your home’s landscaping could use a little tidying up, we suggest taking the time to do so, as it can make a notable difference in the appearance of your home. By simply giving your grass, bushes, flowers and trees in your yard a little love and attention, you can significantly increase your curb appeal, inevitably increasing the value of your home as well. If your end-game when selling your home is to sell it quickly and for the most amount of cash, really dive into what parts of your home need remarkable attention and decide where you should spend your time and money. For example, if your home has holes in its walls, we recommend fixing those before selling. Or, as another example, if your home’s fence has missing poles or is falling down, we suggest fixing it ot make it look brand new. These minor repairs go a long way in regards to your home’s overall value, so it might be worth it to spend a little time for a big reward. Think about it this way: If you were a homebuyer or home investor, what would you be looking for in a home? By putting yourself in a prospective buyer’s shoes, you’re able to think about what needs to be done to make your home more appealing. Homebuyers and home investors look at everything from functionality to overall aesthetic appeal of a home they’re interested in. They’ll notice your home’s squeaky doors and leaky faucets as well as its interior and exterior paint jobs. More often than not, their intention will be to flip your home and resell it at greater value or to rent the property. By completing the repair work for them, you’ll likely get more money and get the ability to sell your home faster, too! This one might seem fairly obvious, but you’d be surprised by how many folks opt not to clean their homes before trying to sell it. Removing debris from your yard and dusting your cabinets will go a long way, as well as arranging your furniture to not make your home’s space look cluttered or messy. Pro tip: If you do nothing else, clean your bathroom! The bathroom is one of the most common rooms that homebuyers will remodel anyways, so if your bathroom looks top-notch, you could get more money for the overall value of your home! Ultimately, getting the most cash for your home comes down to your negotiation skills. If you do your research and know what your home is worth, you can discover how to relay that message best to your interested homebuyer. You’re looking to get the most money for your home while the buyer is looking to pay the least amount possible — don’t be afraid to hold out until you get the amount you desire. These tips will help you while you navigate the home-selling process, but keep this in mind: At Cash 4 Kansas Homes, we only purchase houses we’re honestly interested in, no matter the condition of it. Our team has more than 50 years of combined experience, and we know the best and fairest offer for your home. If you’re in the Kansas City area and need to sell your home quickly, our team of experienced cash home-buyers can help. We strive to make the process as easy and convenient for our clients as possible, and we take pride in helping homeowners sell their homes with no hassles or obligations attached.